Why is Castle Drogo called Drogo? A question that a lot of our volunteers are asked is why is Castle Drogo called Drogo? It was the distant echoes of the Norman Conquest that inspired Castle Drogo. The nearby village of Drewsteignton was mentioned in the Domesday Survey of 1086 as Taintone, meaning village on the River Teign. Manorial records from 1275 identify the village as ‘Teynton Drue’ while, during the reigns of Henry II and his son Richard I, the manor at Drewsteignton was held by the Norman baron, Drogo de Teigne, also known as Drewe de Teignton. It was the coincidence of this name that prompted Julius Drewe to purchase a large tract of land in Devon and change the spelling of his surname to that of his supposed ancestor. He also engaged an architect to supply him with the type of ancestral pile that providence had omitted to provide. Shopping at the Home and Colonial stores. ‘Brand image’ is nothing new. In 1883 Julius Drewe and his partner John Musker opened their first Home and Colonial Store, and within 12 years there were 107 stores all over the country. So successful was Julius that he was able to retire aged only 33. When he sold his remaining shares in 1919, they realised £1 million! John Musker also became a country gentleman, becoming a breeder of fine English racehorses with a superb mansion at Shadwell Park in Norfolk. When Drewe and Musker opened their first shop on the Edgeware Road they established a layout and design- or ‘brand image’- that would identify Home and Colonial shops wherever they appeared. Here the marketing instincts of Musker no doubt played a significant part since he knew the importance of making the shops ‘stand out’ in a High Street full of shops with similar frontages. 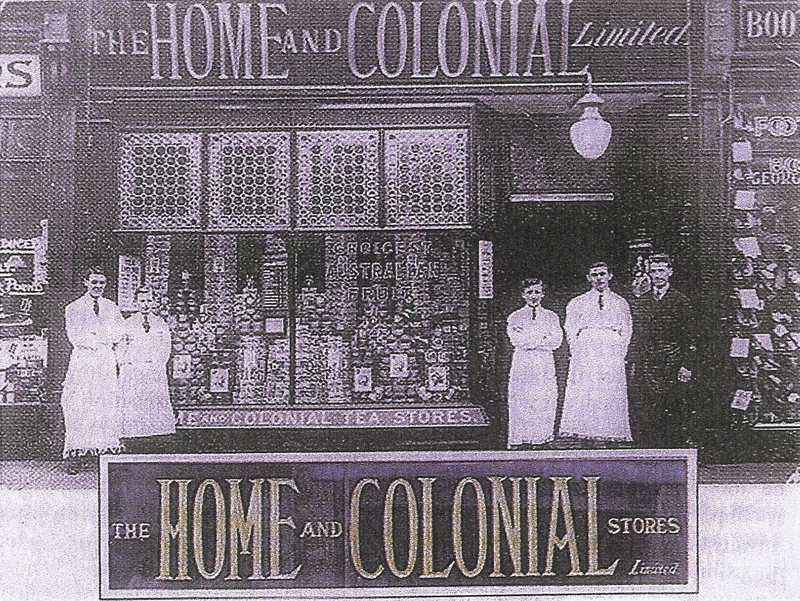 As a result Home and Colonial Stores appeared in prominent positions in the high street and were usually large, glass fronted places with the company name prominently displayed above in large gold letters on a black background. On the inside, the shop was large and laid out so as to give the customer ample room to browse while waiting to be served. From the early days right up until the end of World War Two, shopping for groceries was a much more leisurely process than it is today and every customer expected to be served by a qualified shop assistant who would attend to their every needs from start to finish. The shop floor was usually tiled and lightly covered with sawdust to keep it clean and dry, and swept at regular intervals during the day. The counter was marble-topped and had a small glass screen to separate the assistants from the customer thus minimising the risk of bacterial infection. Cheese was sold from here and in those days dairy products were not pre-packaged. The shop assistants individually cut and weighed and wrapped cheese, bacon and butter. Peak Frean’s biscuits were always in evidence in the store. The biscuits came in 12-inch tin boxes and the various flavours were usually spread out in a circular arc just in front of the counter. The customer selected and the assistant weighed them out. To complete the in-shop image the staff were always immaculately dressed. The shop manager in a dark suit with mandatory collar and tie, and the assistants wore white jackets with collar and tie plus full length, and were checked every morning. As employers, Home and Colonial Stores were second to none. They paid meticulous attention to staff training both at managerial and floor level. Witness to this is the existence of a large training college in Wood Green, London. How is the building work going? 2,600 granite blocks will be removed and taken down to the ground. Remove and repair 913 brass framed windows, we have taken out over 400 to date. 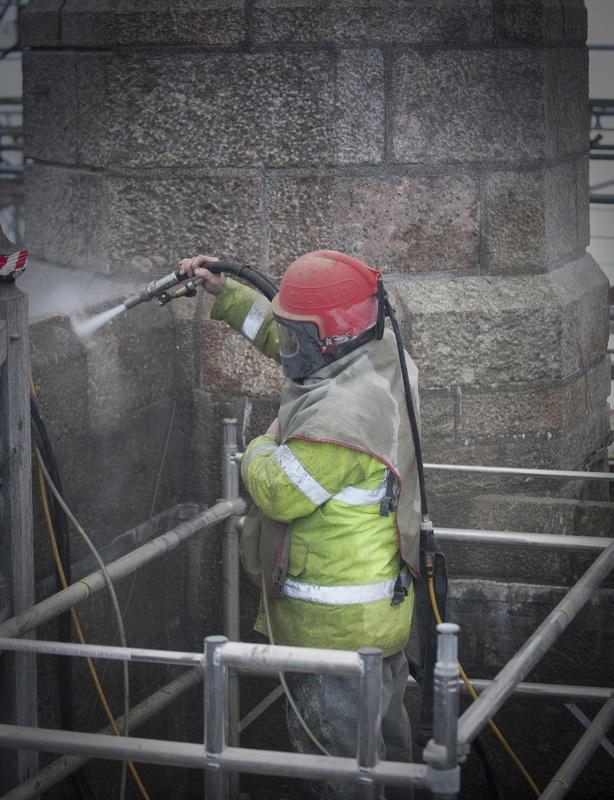 Raking out and reporting 64km of mortar joints-that stretches from Drogo to Lundy. Good progress on the roof is being made (despite the adverse weather we recently experienced!) Over 60% of the masonry had been dismantled, these blocks are from the parapet and structures above roof level so that the high tech roof system (Bauder membrane) which will finally make the roof watertight can be installed. In fact the first sections of the Bauder membrane have already been installed , the area that this membrane will eventually cover is equivalent to the area of almost 2 football pitches. However, before the blocks are removed and taken down to the ground it seemed like a good opportunity to clean them. After over 100 years the granite has become discoloured due to organic matter and mortar staining. 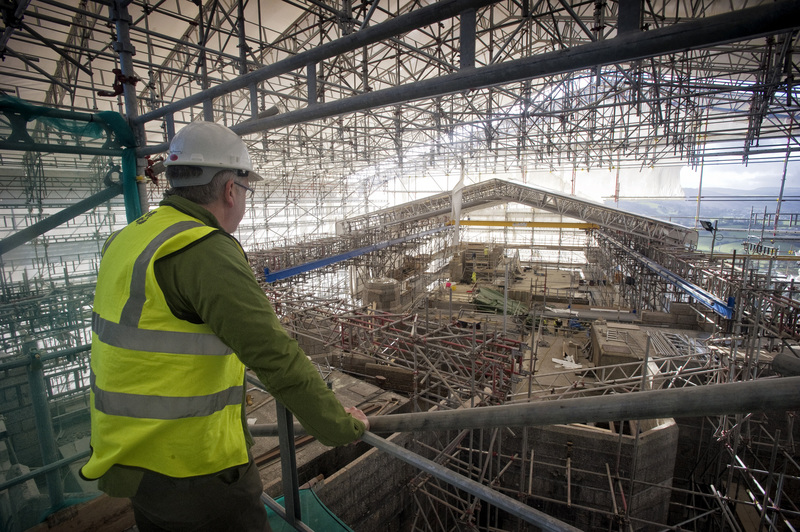 You can see all of this work going on by climbing up the project viewing platform, which is open daily from the 8 March (weather and staffing permitting, restrictions apply). It gives you a real sense of how much work is involved in making the castle watertight and watching the builders at work. You can also admire from inside how impressive the scaffolding structure is. The total area of the temporary roofing is equivalent to 6 tennis courts, and the amount of poles amounts to 24,700!